The seasonal migrations from England to Newfoundland, begun in the 1500s, endured for nearly four centuries and involved numerous generations and hundreds of thousands of individuals. Even by Elizabethan times, the Newfoundland fishery was highly regarded as a national resource and was highly prized as an activity that trained men and boys to the sea, 'a nursery of seamen'. Throughout the southwest of England the overseas cod fishery became an established industry, and migration to Newfoundland became a major cultural tradition. While much of the migratory activity at home was focussed on the ports where the fish merchants operated and whence the ships sailed, the working population that went to Newfoundland each year was distributed throughout surrounding villages and inland market towns. The ships that went into the fishery were often known as 'Newfoundlanders', and the people that normally went in them were locally referred to as 'Newfoundland people' or 'Newfoundland men'. In other words, the migratory fishermen and others engaged in the overseas cod trade were recognized at home as a distinctive class or cultural group. Many migrants to Newfoundland entered the Newfoundland trade as boys, as parish apprentices or were youths taken out by their fathers and older relatives. Other young men went initially as indentured servants, sharemen in a fishing crew or as salaried employees for a summer or two summers and a winter, or longer intervals. Most were erstwhile adventurers who spent short intervals in the Newfoundland cod trade but some spent the main part of their working lives in it. Fishing was one of the hardest and most dangerous occupations on earth and the overseas migratory fishery was very demanding, risky work. In addition, the seasonal migrants endured the ice-infested waters off the Newfoundland coast each spring, and risked their lives twice a year crossing the Atlantic in small wooden sailing vessels. Despite this, the fishery was for many a temporary adventure which offered the prospect of good wages. The Newfoundland fishery had important social and economic effects throughout southwestern England, particularly in South Devon and Wessex where migration was most intensively concentrated. The migratory fishery helped establish new regional economies by contributing to the growth of many communities, generating income and wealth for numerous families, and furthering trades and businesses in surrounding inland towns and villages. At different stages, ports such as Plymouth, Dartmouth, Teignmouth, Topsham, Weymouth and Poole had a greater dependence on the Newfoundland trade than any other activity. Ports such as Teignmouth had a greater dependence on the Newfoundland trade than on any other activity. From J. Sydney Curtis, Devonshire: Historical and Pictorial (Southampton: Topographical Publishing Company, 189-) 45. From the mid-18th century, Dartmouth, Teignmouth and Poole were occupied predominantly by merchants, ship-owners, captains, seamen, tradesmen, fishermen and their families involved in the Newfoundland cod trade. 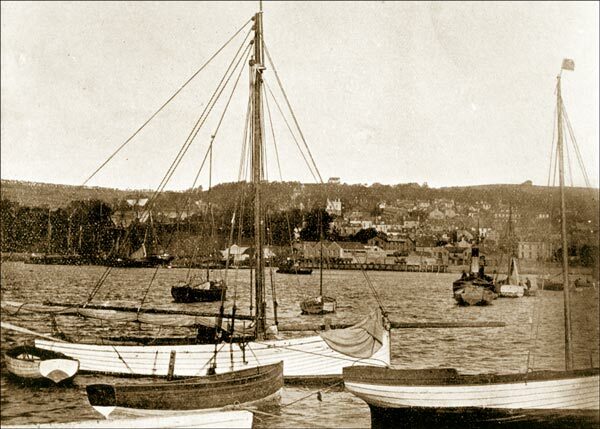 Villages such as Shaldon near Teignmouth and Kingswear near Dartmouth were inhabited almost exclusively by families dependent on the Newfoundland fishery. Newton Abbot, an inland market town in South Devon, was a major recruiting place for both Teignmouth and Dartmouth, and was home to families who depended on the Newfoundland trade. In 1809 a visitor to Newton Abbot reported that "Sixteen Captains of Ships which sailed to Newfoundland...resided with their families at the place," and that "at the season appointed for hiring there have been 1200 Sailors assembled in the town to be hired." Obviously a large proportion of these came from outlying areas since Newton Abbot`s own population was only about 2500. At times also, Poole ships embarked nearly as many migrants to Newfoundland as its own total population. About 70% of this seafaring-fishing community resided in towns and villages throughout the Wessex countryside. There were substantial "Newfoundland" communities resident in such places as Christchurch, Ringwood and Fordingbridge in Hampshire and in Wimborne Minster, Sturminster Newton and Bridport in Dorset. In spring, men and boys flocked to Poole to sign on as sailors, tradesmen, fishermen or servants in the Newfoundland trade. Most returned home in the fall, but some stayed on for longer periods and some for good. 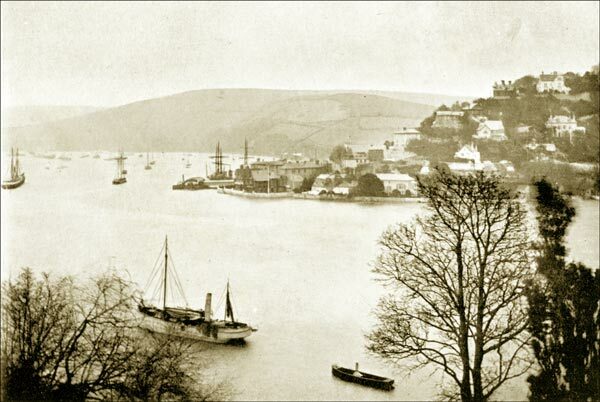 Villages such as Kingswear near Dartmouth were inhabited almost exclusively by families dependent on the Newfoundland fishery. From J. Sydney Curtis, Devonshire: Historical and Pictorial (Southampton: Topographical Publishing Company, 189-) 97. Of the known English immigrants who settled in Newfoundland, 80-85% originated in the southern and southwestern regions of the country. About half of these came from Wessex (with 30% from Dorset, 8% from Somerset and 9% from Hampshire). Devonshire sent about 35%; Bristol, London and Liverpool each provided approximately 2-3%. The balance came from other English origins. By place of birth, West Country and Wessex immigrants may be divided roughly equally into three major groups. The first includes immigrants from English ports such as Poole, Dartmouth, Teignmouth, Plymouth, Topsham, and Bristol. Another group came from market towns such as Newton Abbot, Ashburton, Totnes and Exeter in Devonshire, Wimborne Minster, Blandford Forum, Bridport, Sturminster Newton, Shaftesbury and Sherborne in Dorsetshire, Yeovil, Crewkerne and Wincanton in Somerset, and Ringwood and Christchurch in Hampshire. The third group were born in smaller rural farming settlements. These place origins were all incorporated into the recruiting hinterlands of ports involved in the migratory fishery and Newfoundland trade. About one-third of the immigrants were descendants of families who had a tradition of association in seafaring and fishing in Newfoundland. Others were artisans and apprentices, a few former small tenant farmers, and many were unskilled labourers. Many were poor, underemployed or unemployed, and moved to Newfoundland to improve their economic lot. Most immigrants first moved to Newfoundland at an early age, usually in the range of 15-25 years, but upwards of 15% were younger.